But when I am on a holiday, I have nothing on my mind. I have a book 24/7 in my hand. Every time we would take a break (from walking or driving) I would go back to my books, while Dr. Fab would go take pictures of the scenery and what not. And it just so happens that he caught me reading (via his lens) more than once. I love these pictures, specially 'coz I they are candid (not staged!) 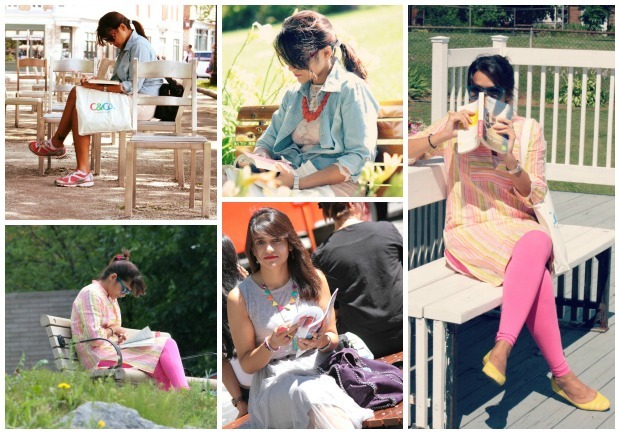 and now I know how I look while reading at random places. Also, they make me nostalgic of my teenage days, when in spite of all the exams, assignments and million other academic books to read, I had enough time to read my fiction too. I really need to stop being such a distracted soul and commit to a book on weekly basis ... I really should ... But I won't ... 'Coz I can't ... But I should ... Agrh! Such a vicious cycle.